Today I want to talk about contact lenses for your cosplay. When you´re choosing your cosplay, pay attention to the eyes of the character you´re choosing. 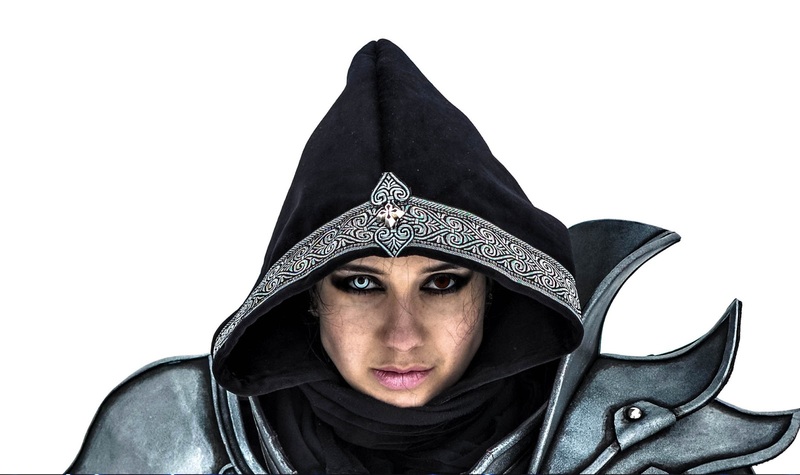 It makes a BIG difference if you use a good kind of lenses for your costume - it adds your costume a wow factor as you can see on the picture. Keep in mind, that there are different types of lenses in terms of durability. You can choose different kinds from 1-day lenses to one-year lenses and it´s important to read how long you can wear them and if you have to put them off at night. The durability then influences the price too. A lot of e-shops offering lenses offer to write/read reviews of prevous owners. It´s important to read these and comepare them with your own experience. It really helps you to choose the right lenses for you. Buying lenses is always tricky - you can buy a new kind and then realize they´re inflicting pain, don´t fit too well or other problems. If you have problems like that, I recommend consulting buying lenses with an optician. Opticians often offer lens samples, that can help you choose the right type of lenses for you. From my experience, it´s wise to buy lenses with good reviews, cause the chance of fitting is great. I once bought a pair from an unknown company and i wore them once. After putting them off, my eyes were red and even i invested less money than in my usual type, i lose a lot because i couldn´t wear them at all. 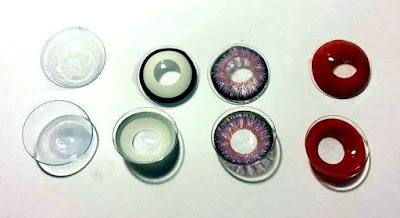 Every contact lens needs to be stored somewhere when you go to sleep (except 1-day lenses, that you throw away after one day of wearing or high-oxygen lenses, that you don´t have to remove for sleep - but i doubt you find colored lenses like that). 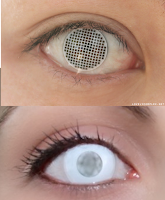 For this purpose you have to buy contact-lenses-lotion and contact-lenses-case. Sometimes you get a free case with larger lotion. I don´t think there are any great advices in that field, but if you´re using lenses regularly, it´s good to switch between different lotions sometimes. Some people are using special pliers to handle with lenses, but I think it´s safer, easier and faster to use your own, washed hands. It´s not necessary for anyone to have eye drops when you wear your lenses. It´s only for some people, that suffer pain or are irritated by wearing lenses - just for comforting the eye. a) Don´t buy used lenses and don´t borrow your lenses - it´s not hygienic and you can catch a disease in worst case scenario. b) If you bought colored lenses, there is a chance it can limit/modify your vision. It´s not wear them by driving and other activities, that demand your full attention. Toning lenses are see-through lenses with slight coloring on the iris part, the pupil is transparent. The main purpose of this kind of lenses is only to tone the eye to change it´s color, but still look natural. I hate this kind of lenses, because i have dark eyes and a lot of types just don´t have enough color to tone my dark brown color enough. It´s really important to read a lot of reviews prior buying lenses like that to find out how covering they really are. I´ve bought purple toning lenses for my cosplay of Ravenborn LeBlanc and they don´t make my eyes that purple, so I can wear them normally. 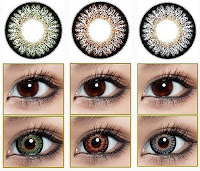 Colored lenses are see-through lenses with rich coloring on the iris part, the pupil part is transparent. . They should completely cover the natural color of your eye, but be careful, they can limit your vision, especially your field of view. I wear them for my cosplay of Headhunter Caitlyn (red) and for my cosplay of Demon Hunter (white with black border). 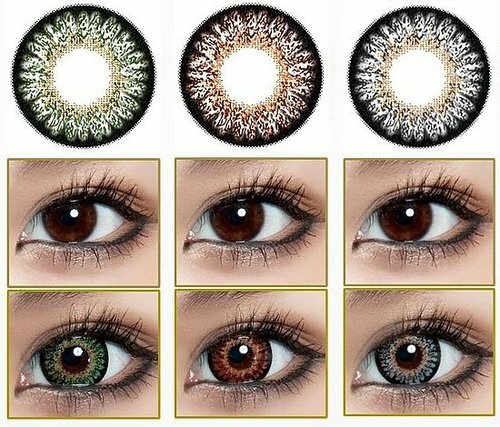 Fully colored lenses are lenses with rich coloring on the iris part and slight coloring on the pupil part. They strikingly limit the vision! 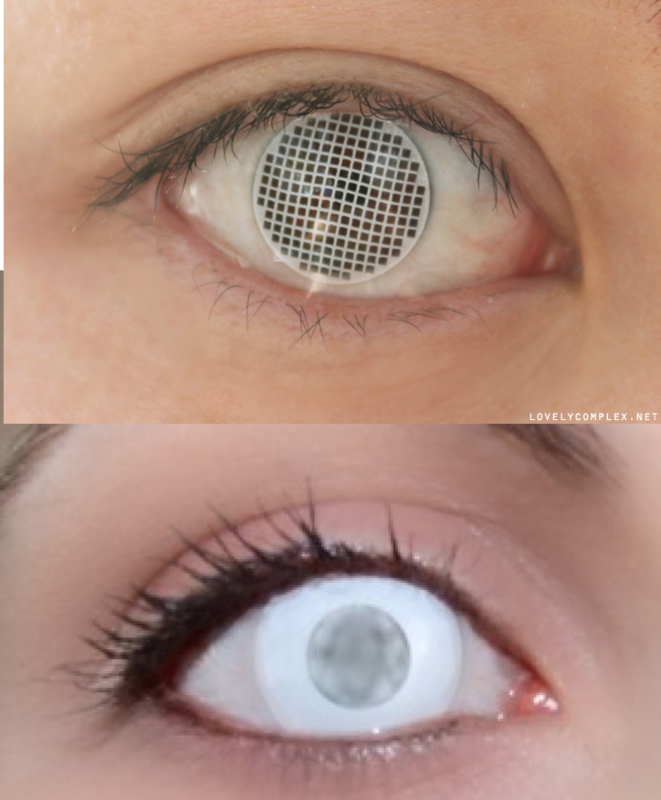 Some lenses have only a small see- through hole for the pupil, some lenses are milky and you see like through mist and some have a net with really small holes in it. They´re really hard to put on/off and really uncomfortable. UV lenses look like normal colored lenses, but start to shine under UV light. They can be used in cosplay too if you somehow import you UV light into your helmet to make your eyes shine - like the Lich King on the picture created by https://www.facebook.com/OCDcreations (no photoshop on the picture). Otherwise they´re great for UV parties or Halloween parties. As I´m quite a fresh cosplayer I don´t have many lenses now. But I can show you which lenses I´m using just for example. I´m linking to different shops, because I don´t want to promote any special shop. All offered shops are great. As I´m blind af, i have to wear glasses or contact lenses. Normally I am wearing Air Optix lenses for one month in a package of 3 pairs. -3,75 diopters, curving 8,60, diameter 14,2 mm. For my first cosplay of Vayne from League of Legends, I didn´t need any lenses, because the character is wearing glasses and noone knows her eye color (and it´s not important). So my premier with lenses was with Demon Hunter. Her eyes are glowing in game and trailer and it depends on the source, but I could have used red lenses (her eyes shine red in the trailer), milky white lenses, white lenses (her eyes shine white in the game), UV lenses (but how to implement UV light without a helmet) or none from these (her eyes don´t always shine). 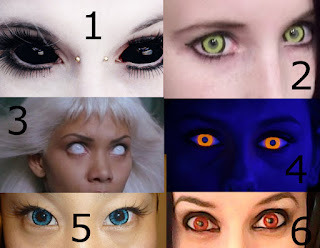 I´ve decided, that the lenses called White zombie would be a good choice and i think I´ve chosen the right ones. They are not so limiting as milky white ones and they make a good WOW effect. -3,5 diopters, curving 8,60, diameter 14 mm. 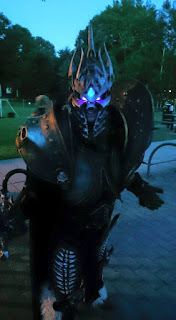 For my third cosplay of Ravenborn Leblanc I needed rich purple lenses, but unfortunatelly I couldn´t find any purple lenses with rich color and the right amount of diopters. So I had to buy only a toning lenses, that make my eyes purpelish. -3,75 diopters, curving 8,60, diameter 14 mm. For my fourth cosplay of Headhunter Caitlyn I´ve decided to use red lenses, even the in-game model has blue eyes as I´m working with Zeronis´ concept art. 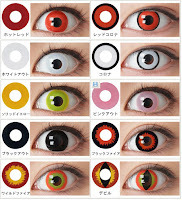 I´ve chosen simple red colored lenses called Red devil.